A Las Vegas great-grandmother says she feels like she is being taken for a ride after she was ran off the road by a hit-and-run driver. Sylvia Dawson says the trouble started on May 9. She was on her way home when a blue sedan forced her into a palm tree inside her neighborhood near Boulder Highway and Flamingo Road. "I was coming home after I had dropped off my daughter and she always says 'mom, when you get home call me,'" explained Dawson. The call would not come until much later. Dawson said she passed out after both airbags on her 2005 Ford Explorer deployed. "I injured my hand, my arm and my leg," said Dawson. The other driver did not stop. Pictures show the front end of the Explorer sustained damage. "Let me tell you, I am an old lady," said Dawson, 80. "I take care of my car, I don't smoke, I don't drink, so my car is always clean, nothing wrong inside," explained Dawson. The vehicle had received new tires and $1,000 worth of maintenance just weeks before the crash, according to Dawson. Dawson said the police did not respond because the crash occurred on private HOA-controlled property and she was not medically evaluated. The damaged vehicle was towed to the front of Dawson's nearby home. She planned to have the vehicle taken to a repair shop the next day for evaluation and possible repairs. "I got up early in the morning to see the car and it was gone," explained Dawson. A search of Dawson's home security camera video revealed a tow company removed the SUV in the early morning hours of May 10, approximately 8 hours after the crash. Dawson claims the HOA's contracted tow company, 911 Towing and Impound, removed the vehicle without providing the necessary written or verbal notice regarding a possible violation of the community's covenants, conditions and restrictions. Dawson and her husband claim they contacted the tow company and a representative told them the vehicle was a total loss due to the damage and offered to have the vehicle salvaged for parts. "I looked at the car and I thought, well, OK," said Dawson. "The [representative] said 'we are going to do this, we are going to give you some money," Dawson explained. The couple said they agreed to sign over the vehicle title to the tow company without any written agreement. Dawson said the tow company representative mentioned the salvaged vehicle would be worth approximately $150. Dawson said soon after the title was signed over she contacted the tow company about the money but heard nothing back for weeks. The company finally got back to her and said she could pick up the cash at the tow yard but ran into another surprise, according to Dawson. "I said, that's my car right there!" she recalled. "The guy fixed it, put a new hood, well, it looks like a new hood," said Dawson. Dawson said once she saw her vehicle was not salvaged for parts, she refused the money. "I hate liars, I'm too old for that crap," said Dawson. As of Aug. 14, the vehicle's title had not been flagged as "salvage," according to the National Insurance Crime Bureau. Contact 13 reached out 911 Towing and Impound and a spokesperson said the tow was legal and authorized through the HOA. The spokesperson tells Contact 13 they had no agreement with the Dawson's regarding the vehicle. The spokesperson says the Dawsons did not have enough money to get the vehicle out of impound so the couple signed over the title in order to retrieve their belongings inside the SUV. The spokesperson adds the vehicle has not been repaired and remains in the same condition as when it arrived. The Dawsons refute that claim. First Residential, the HOA's property management company, says they will not discuss any matter with Contact 13, citing privacy and confidentiality. However, a spokesperson tells Contact 13 all applicable rules, laws and guidelines were followed when Sylvia's SUV was towed from in front of her home. The community's rule book says vehicles can be towed immediately and without warning if the vehicle poses an imminent health or safety hazard. This could include leaking any sort of liquid, the spokesperson added. 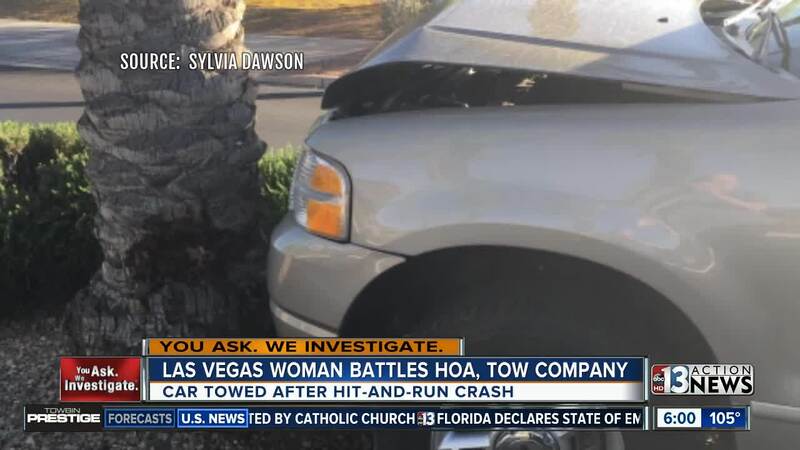 Sylvia and her husband have two options: request a hearing with their HOA on the towing matter, or file a complaint with the Nevada Real Estate Division, Office of the Ombudsman.